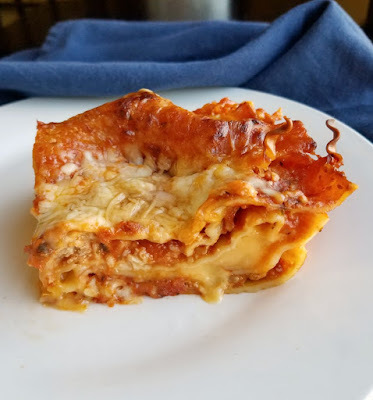 My Maw-Maw's lasagna has a few surprising ingredients that likely make it a bit different from the one you grew up with, but it is so delicious. You have to make some for dinner soon! The lasagna I grew up with has a few unexpected ingredients, but it is so good. There is a reason why my family keeps coming back to it after all of these years anyway. Make a pan full of my Maw-Maw's American lasagna for a perfect comfort food dinner. I grew up having neither in my lasagna! MiMi made lasagna completely different and she learned to make it that way from Maw-Maw. So get ready to be shocked, amazed or possibly horrified. No matter what, just promise you will give it a try! Are you dying to know what the secret filling is? I guess I can let you in on the family secret. 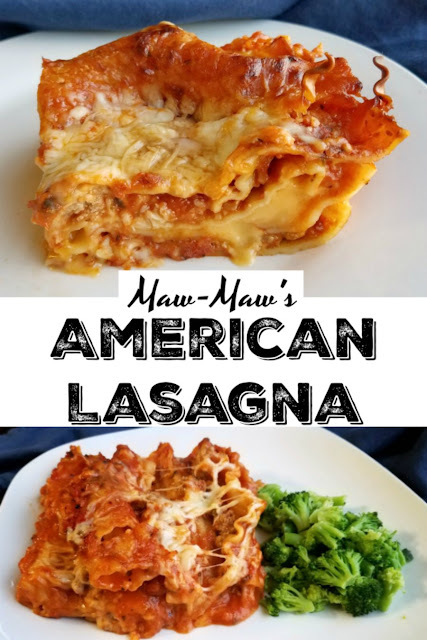 Maw-Maw used American cheese in her lasagna! I know, I know. I'll give you a minute to digest that. Ok. Now sit down for this. I know you are in a fragile state already, I don't want this next part to do you in. Instead of Italian sausage, she uses ground beef. 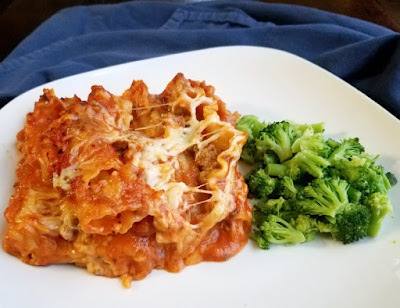 A ground beef and American cheese lasagna, and it is AMAZING! You just have to give it a try. This was always one of my favorite dinners growing up. It was usually a birthday or special occasion dinner and everyone loved it. As the years went on, I became the chief lasagna maker, a role I was happy to take. I always loved helping in the kitchen. Now I make a variety of lasagnas, but there is always a special place in my heart for this one. My husband, who thinks his mom's lasagna is pretty much the only one that deserves to go by the name of lasagna, was even a fan! What are you waiting for? Give it a try already! Start with a thin layer of sauce on the bottom of the dish. Place a layer of pasta over the sauce. Overlap the noodles to keep distinct layers. Next, layer more sauce, half the meat and half the mozzarella. Make another layer of pasta followed by slices of Velveeta. More pasta sauce, meat and mozzarella. This time I stopped there due to there only being three of us and the pan I chose, when I was a kid I would do one more layer of pasta and sauce. Cover with foil and bake for an hour. Remove the foil when there is about 10 minutes left and sprinkle on the Parmesan. Return to the oven to finish the baking time. Let sit for 10-15 minutes before cutting and serving. I always like to add a little garlic and Italian herbs to the ground beef to add a little extra flavor. This has always been one of my favorite meals too. I grew up in a suburb of Chicago and was surrounded by Italians. Somehow I grew up believing this is the best way to enjoy lasagna. I still like it best. It is definitely still up there among my favorites too! This lasagna recipe looks so good! I never think to use that cheese. I know, it is a different recipe but soooo good! My husband is Italian so we love Italian food and I'm partial to Lasagne. Thanks for sharing with us at #WednesdaysWisdom and have a great week. Lasanga is one of my favorites too! There are few different varieties that I love, this is one of them. I could probably eat them all in rotation and never get tired of it! This looks great Carlee! I have never really had any luck making Lasagna so I need to give this a try. And yes I usually use ricotta or cottage cheese so I love the velveeta in this! A keeper for sure! Thanks for sharing with us at Throwback Thursday! It is a fun twist, that is for sure! I hope you love it! Thanks for hosting. I will definitely put it on my "Must try" list! I was in high school before I realized this wasn't "normal lasagna!" We really love this version. I hope you do too! 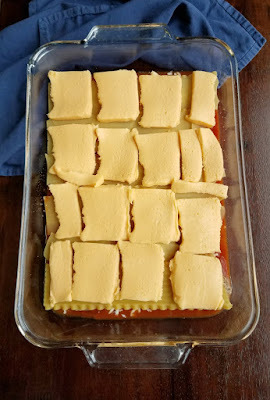 This lasagna recipe. I have tried both versions.with ccottage cheese and ricotta and together as well. And I always use ground beef. Love them both. Love lasagna in general. Me too, it is hard to go wrong with lasagna in my book! 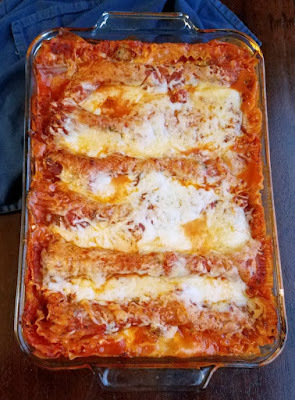 We make it with Cheese sauce :) Thanks for linking up to Pin Worthy Wednesday, I have pinned your post to the Pin Worthy Wednesday Pinterest Board. What a great idea! Thanks for hosting! Deliciousness! YUM! We're actually having lasagna this week! Yum! I absolutely love lasagna in all of its forms! I absolutely love this! Doesn't get more Midwest than Velvetta and ground beef! Will definitely try this next time I make lasagna. Thanks for the great recipe! It is definitely Midwest comfort food! Thanks for stopping by! It is definitely a little different than normal, but we love it! I have never heard of lasagna with Velvetta Cheese, very interesting! Thanks for linking up to Merry Monday! Sharing onour Mm Pinterest Board ! Have a great week! It is crazy, isn't it?! I didn't know lasagna was made any other way as a kid! Thanks for hosting! Yes they are! They are full of memories and are so much fun to pass down. This one is definitely one of our favorites! Maw Maws Lasagna looks awesome! Thanks so much for sharing with Full Plate Thursday and have a great day. Thanks Miz Helen, we really enjoy making it her way! I don't think we can get Velveeta in New Zealand :) I've always made lasagne with a cheese sauce. That probably turns out very similar! It is so much fun to hear how people make their lasagna. It seems like each family has their favorite way! Looks good! Thanks for sharing at the Whats for Dinner link party at the Lazy Gastronome! It is one of our favorites! Thanks for hosting! YES!! A lasagna I can serve the family! 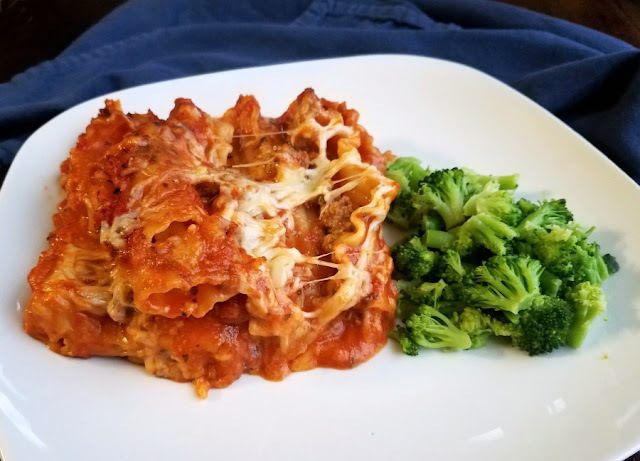 None of my group are fans of cottage cheese in lasagna, so this one should win them over. Thank you for sharing your family recipe over at the December Country Fair Blog Party. I hope they love it! Thanks for stopping by! We will love this lasagna,it looks delicious! Thanks so much for sharing with us at Full Plate Thursday. Hope you have a great weekend and come back soon! It is a fun variation and one of our favorites! Carlee, this lasagna sounds delicious, American cheese and ALL! :-D I made it a feature at this week's Whimsical Wednesdays Link Party. Thanks so much for sharing with us and have a wonderful week! It is definitely a bit different than most, but we love it! Than you so much, Michele! American cheese huh!?! That sounds like a great idea to me. I am going to try it! It's unusual but so good. I hope you enjoy it as much as we do!